A library search discloses that this ‘round’ is from an ancient text of unknown origin. The “Great Songs Thesaurus’ says the earliest found publication of these words was in 1852: the music was added in 1881. In case you wonder, there is a spiritual interpretation of this song given at the end. In presenting this information, I will draw almost exclusively upon what has been said by both ancient and modern mystics and heavily upon the Edgar Cayce Readings in particular. If we are ever to obtain an adequate understanding of life, one that answers our many questions, it will most likely come from the ranks of the mystics. They demonstrate unusual abilities that I believe are due to soul development of a positive type. Most express many admirable qualities such as kindness, optimism, encouragement, compassion, honesty and many other attributes that have been collectively called “fruits of the spirit”. They often expend great effort to help people in any way that they need help. Many if not all have had a transcendental experience and so I believe they are speaking from first-hand knowledge and not just from an opinion. Your first reaction to this may be to say that they are hard to understand. Such obstacles often arise because almost all verbal communication is based upon shared experience. Knowledge gained thru transcendental experience is difficult to share or describe. It is of the same degree of difficulty as trying to explain color to a person born colorblind. Still there is some communication that is clear and if we only benefit from that part it is worthwhile. We also need to acknowledge our own limitations. The wisdom of the Readings shines thru in this area. Reading # 1297-1 says: “What is truth today may tomorrow be only partially so, to a developing soul.” It suggests that we need to grow inwardly before larger truths will ‘fit’ us. We should not expect to be able to grasp truth the instant we hear it. It is also correct to say that our efforts earn us the right to know truth, as in “Seek and ye shall find.” Even after we overcome these, there is another important step. It doesn’t much matter what you say you believe. What does matter is what difference what you say you believe makes in your life. Some say that the Edgar Cayce readings can be unclear or confusing. While I cannot understand them all, it was not hard to follow what he said about reincarnation [many lives]. I had heard about reincarnation before but only he gave me incentive enough to pursue the subject. For that I am enormously grateful. I must admit that my chief motivation for making an intensive effort to learn more about it was because it was important to me to be correct in my beliefs, not because I knew how beneficial it would be. Being aware of those benefits earlier would have been helpful. Only much later did I recognize how much it enriched life and how it allowed a much more positive outlook on life than seemed possible before. It provided many answers to questions that had plagued me until then. Indeed it seemed like “the big answer”. Now I find that it was a stepping-stone to a bigger answer that adds significantly to my understanding of reincarnation and then goes far beyond. As a specific; while reincarnation brought me the first adequate appreciation of the Patience of God, only the life-dream concept made me realize the true extent of God’s Love and Wisdom. In retrospect, it seems strange that I was aware of this greater concept for many years and had been making notes as I encountered it in books or lectures, yet never realized how meaningful it would become later. The best explanation for that I can come up with is that the references I found did not discuss the value of the concept to any extent. Ordinarily it was just stated it as a fact. Even in recent times I found that mystics were not questioned further when they made such statements, nor was anything more volunteered. It is definitely included in the Cayce readings in the same way and hard to find as well. In subsequent research I found that many other readings supported it. These facts provided me with the incentive to write this article and others mentioned at the end. While pursuing that research in the ‘readings mine’, I came to realize that there may be many other undiscovered ‘gems’ in them: one reason being that Cayce would [though rarely] volunteer information related to the reading but not requested by the seeker. Probably the most famous case of this is his casual statement “he was once a monk’ when giving the Arthur H. Lammers reading, # 5717-1 in 1923. This small phrase opened up the rich treasury of information on reincarnation in the Edgar Cayce readings: information that could possibly have been lost. A note by Gladys Davis on 10/5/64 identifies it as the first reference to reincarnation, and then later, on 9/27/76, she corrects this statement and says that Rdng. 4841-1 on 4/22/11 mentioned it first. There, at the top of page 4 we find the phrase " soul transmigrated' and other relevant statements. That means the information could have begun to be explored some 12 years earlier. If it were never pursued at all, how much less significant would the impact of the A.R.E. be today? It would mean that none of the life-readings would ever have been given. The subject at hand is another very similar circumstance. It was also volunteered in a reading for a woman who had been his elder sister during the Persian period. He was then named Uhjltd and she was Uhjltda. It also mentioned other lives that they had shared. The reading is #259-8, where in pp. 6 it says: " For, will is the factor that makes for growth in the soul's sleep through the earth's experience. For, with the birth of a physical body the soul slumbers; and its dreams are the deeds by which the soul is judged in its associations with its fellow man." I found no evidence that anyone paid any attention to this remark at the time or followed up on it in later readings. Neither have I heard anything of it since [from A.R.E. that is. I have heard of it from many other sources]. There seems to be three possibilities why this is so. #1. People don’t know about it #2. People don’t want to discuss it for various reasons, or #3. It is not considered important. How could the dream of our soul be unimportant when we know that the dreams of our conscious self are highly important? That dream of our soul is our very life here on earth! This may well be the most important concept ever given in the readings! That should eliminate #3. #1 can be corrected by the usual methods of communication. #2 is the hardest to overcome. It upsets our lifelong, familiar and comfortable convictions about ‘reality’, but here is a compensating thought; as our sense of physical reality is weakened, our sense of spiritual reality is strengthened. It is only proper to acknowledge here that we may have introduced a startling new concept to the reader. You may already feel on the defensive about your present convictions. You certainly are not prepared to instantly change them. This is only an introduction to the subject anyway. All we hope to do is give you an idea of why this subject is worth investigating and the incentive to do so. Naturally, we are going to put forth supporting arguments and cannot avoid trying to be convincing. It is being done with the best intentions and with no expectations about immediate results. Now let us go on. Perhaps you have already recognized that this concept is in itself a confirmation of ‘As above, so below.’ We spend a large part of our life in sleep and it is an essential function. The counterpart in the spiritual world would be that the soul sleeps too! This alone should help us accept the truth of the statement. How can we go about grasping the implications of this life being a dream? It is not an easy or short task. My approach was to analyze the commonly shared characteristics or patterns of familiar night dreams. Then if we employ “As above, so below” in the analysis, we can apply that pattern to the soul’s dreams [its many earth lives]. Once we see that one life here is to the soul as one night’s dream is to us, again the pattern fits! Starting with only the most basic nature of dreams, that they are unlimited as to resources and are personally fashioned for us and independent of all others, we can immediately see life in a completely different way. We can begin to think of all of life’s events in terms of ‘Why is this a part of my dream? What is the message, or the test, or the opportunity given’? [To me or perhaps to all mankind] All sorts of new possibilities exist. If life is a dream it must also mean that SPIRIT is in charge of this world without it being obvious in the least. That brings up a very important new insight, perhaps THE most important. It seemed necessary to believe that free will had to include the right for evildoers to inflict harm as they chose to do. If we accepted the karma principle, that gave us an excuse to say they will pay for it later and even to assume that there are no innocent victims. But why have we assumed any of this? Only because we needed an answer and we knew of no alternative. Now we can say that free will need not include the right to force any experience upon another being. It will however determine our own life experience, as it should. An evildoer may well see their intent accomplished, but it will only take place in their life-dream. We do not have to supply a guilty or willing victim as in the ‘real world’. I consider that a wonderful improvement. Now consider the statement that goes ‘As we do it unto the least of these, our brethren, we do it unto God’. It takes on new meaning, doesn’t it! Can we allow this new view only for small circumstances but not for major events? Perhaps spirit wishes there did not need to be major events either but if that is all that will get our attention! We would all like to have our life as well as everyone’s life consist of only ‘pleasant dreams’ and never nightmares. If we were able to progress properly under those circumstances, perhaps that could be so. Next, consider that real life provides very limited opportunities for wealth, fame, power and the like, but our soul’s education is probably incomplete without those experiences. Is Spirit to be limited by this situation? Reading #5575-2 informs us: Is God’s hand so short that there would not be all that each soul would require? In addition, if all souls existed at the beginning, did they have a long wait for the opportunity to experience an earth life? These are only a few examples of the new possibilities opened up by this concept. Every good thing can be abused. This is no exception. If we see someone in need of help, can we now say it is not real so we do not have to be concerned? Of course not! It could be a test of our compassion or generosity. It is not in our dream by chance. Nothing is. I know that many people accept that angels are involved in such tests as well as in protection. Many convincing stories are told about such events. If we can accept that angels can come into real life now and then, why should it be hard to accept that they are always present if needed? In all this there is no reason to think that we do not share real events with real people as long as those are proper for our experience. If God intended us to be His companions, as Cayce said, we should certainly have that companionship with each other, both here and beyond. Nothing happens by chance. #3684-1 plus 3 others. These all confirm for me that Spirit is indeed in charge of events here on earth, even those we may be inclined to prematurely classify as bad. None of these even remotely imply that life is actually as it appears to be on the surface. All, however, are hard to accept and so ordinarily they are not discussed either. What are we to do with those statements? Do we just pick and choose which we will accept, or reject them all, even tho they come from a source we have faith in? 21. (Q) Comment upon the following. Is it worthy of expansion; that is, does it carry any light of truth? ...... The Creator, in seeking to find or create a being worthy of companionship, realized that such a being would result only from a free will exercising its divine inheritance and through its own efforts find its Maker. Thus, to make the choice really a Divine one [The Creator] caused the existence of states of consciousness that would indeed tax the free will of a soul; thus light and darkness. Truly, only those tried so as by fire can enter in. (A) The only variation that we would make is that all souls in the beginning were one with the Father. The separation, or turning away, brought evil. Then there became the necessity of the awareness of self's being out of accord with, or out of the realm of blessedness; and, as given of the Son, "yet learned he obedience through the things which he suffered." Cayce’s answer to the above opened up a new insight for me regarding why we contend with a lower self here. We may be experiencing now what God experienced then. A part of us is uncooperative, disobedient or rebellious just as souls were then. To our own souls we may appear to be the same. We probably would not learn this lesson any other way. The phrase “tried as by fire” also explains why some life-dreams are like nightmares. Is then our reality, all reality, truly only states of consciousness? If we say ` Life is a dream’ or say `Life is a state of consciousness’, isn’t that the same thing? The plural says there is more than one state. Some mystics list these as the Waking Dream and the Sleeping Dream. Another mystic uses the same terms and also calls them objective reality and subjective reality. Another says; “What people call reality does not exist anywhere. Everything is a dream.” Paramahansa Yogananda speaks of “the dream atoms of this phenomenal world” and explicitly calls God “The Divine Dreamer.” These are only a few examples. Many more appear in another article mentioned later. I have gone on without always quoting proper references here. They are in the other articles I mentioned as having written and which I hope will now interest you. The two most important are both called `Reincarnation: Dreams Of The Soul’. Part 1 draws only upon the Cayce material and uses diagrams primarily. It conveys certain relationships between our dream, waking, soul and spirit selves. It shows that these states of consciousness have repeating patterns, long and short cycles, and much more. It identifies other Readings that support the dream concept. Part 2 relies on words alone and contains many more supporting references [20 and growing] such as the ones mentioned. It cites the advantages of a belief in reincarnation and addresses objections to it that may have deterred many from adopting the belief. It also analyzes our sleeping dreams more fully and shows how they have the same characteristics [9 in all] as our soul’s many life-dreams when examined from the soul’s perspective. The conclusions I have drawn about why life is a dream are supported by the two mystical principles cited earlier and I have not sought to discount or deny the painful aspects of life. They still are more positive and helpful overall than other philosophies I have found. Some parts are optimistic, it is true, but I believe it is justified. I’m sure you have heard, as I have, that believing is seeing and not the other way around. We are also told to pray as tho we have already received an answer. Didn’t the Master also say, “ As you believe, so shall it be done unto you.” Did that really only apply to one man and one situation? I think not. So I believe now that we must have confidence that God would and did come up with the most perfect, the most loving possible plan of life. It now seems obvious that only He could have devised such an ingenious plan and further only He could make it work out. I further believe that we will someday awaken back in our former state of blessedness and find we have had no worse than a nightmare [if we can even remember them since they don’t exist anymore per #1691-1]. No harm permanently befell us or anyone else. Yet we will never lose the memory of the joys of many lives. It is my sincere hope that you will be able to agree with this higher view of life and have it become a part of your beliefs. That is the only way to make it your reality. "Maya is not illusion, it is the creator of illusion. Maya is not false, it is that which gives false impressions. Maya is not unreal; it is that which makes the real appear unreal and the unreal appear real. Maya is not duality, it is that which causes duality." Under the influence of Maya we divide the world into categories. We split the world into "myself" and "others." We fail to see the unity of all things and our connection to the ultimate reality. We go through life as if in a dream, failing to see the true nature of ourselves and our world. Unless we are liberated from Maya we fail to see that "Life is but a dream," and we are bound by our attachments to sense-objects and states of mind. Notice how this, like our nursery song, relates the illusory division of things in the world to the flow of Tao, or the way of living unencumbered by Maya. Finally, looking back at our first line, "Row, row, row your boat," we can easily see that the "boat" refers to our "self," or our life in the stream of existence. 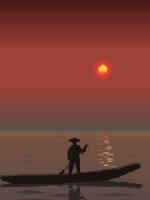 "Row, row, row," shows us that we must direct our lives through skillful application of repetitive practice. One does not become a skilled rower on the first try. Rather, one must row, row, row. Thus, like the person giving directions on how to get to Carnegie Hall, the spiritual advisor will instruct the initiate that the way to greater realization is "practice, practice, practice." f ** Quoted in Reader’s Digest, May, 1998. from Manhood of Humanity, By Alfred Korzybski, Institute of General Semantics.